To all my gluten free and plant based homies, this is for you! I got in a funk with cooking.. we went away on a vacation and then Christmas and New Years… oh and then we got the flu. So needless to say, we were busy and/or I got lazy. Either way I’m back on my game, testing new recipes and cooking up a gluten-free and plant based storm! I eat a mostly mexican out, because it’s easily gluten free and vegan without having to alter much on my order. I must say gluten free is hard, plant based is hard… combine the two and get back to me. Damn it’s hard when you are out to eat. I’ve had to order sides of veggies before as a meal because there was literally NOTHING on the menu for me. Oh and last vent.. if you have a veggie burger… make sure it’s gluten free… thanks, K bye! lol Anyone feel me on this? Alright, rant over….back to the dish! Since we eat a lot of mexican out I try to create dishes at home that are not mexican inspired. Hence my Thai soup here. I’m going to warn you, it has a little heat to it, so if you aren’t a fan of hot stuff, use less Thai curry paste. 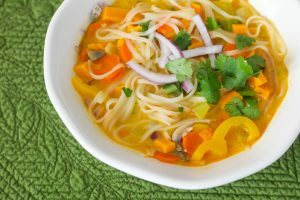 So here it is, a gluten free and plant based soup that’s filled with flavor, a little heat and lots of veg. Wash and prepare all the vegetables and set them aside. Chop the carrots into coins and slice the mushrooms. Cut the peppers into long strips. Cut the red onion in half and then thinly slice into long strips. Peel the skin off the sweet potato and chop into very small cubes. Chop the leafy tops off the bok choy and slice into long thin strips. Chop the bok choy stalk into 1 inch strips. Add 3 Tbsp of oil to a large pot or dutch oven. Add the minced garlic, grated ginger and Thai red curry paste. Sauté over medium heat for 1-2 minutes. Add 1 Tbps of oil and the sweet potato. Sauté for another 1-2 minutes. Add bok choy stalk, peppers, carrots, 1/4 the red onion, mushrooms and vegetable broth. Bring the pot to a boil, then reduce heat and let simmer for 5 minutes. While the pot is simmering, boil water and cook the noodles. Drain once cooked and set aside. Now add coconut milk, fish sauce and brown sugar and bok choy greens to the pot. 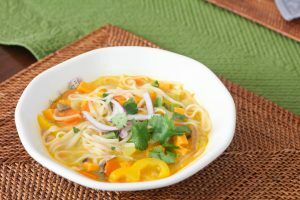 To serve, add noodles to a bowl and spoon the soup over top. Garnish with raw red onion and cilantro. I know you just read this and thought.. sweet potato… no! My husband is not a fan of sweet potatoes and he agreed that they actually really compliment this dish! This is our new way to get sweet potatoes in our diet. 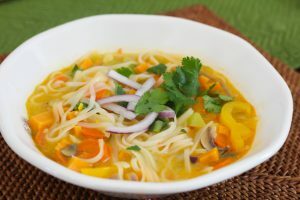 Okay guys, I hope you enjoy this soup! Happy Eating! Yum! Now that I’m done with whole 30 I’m planning to get back to more meatless meals. This looks great! Which curry paste do you like? I’m always hunting around for a good one. 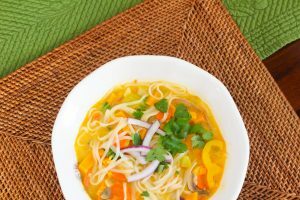 We did an amazing Thai soup this week that was similar but had TONS of lime juice. The spicy, sour, creamy was awesome. 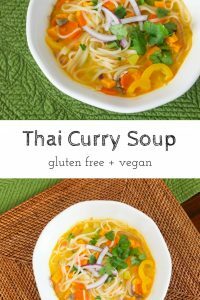 I’m gonna try yours, cause I can’t get enough of yummy thai soup.